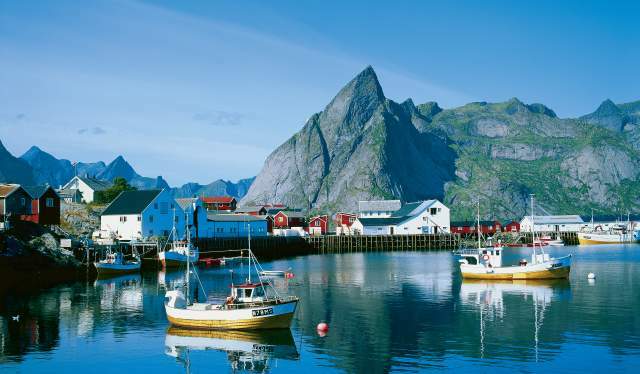 XXLofoten can help to arrange your meeting or event in the tranquil setting of the Lofoten Islands in Northern Norway. If you want to hold a meeting in a traditional fishing cabin (rorbu) in the Lofoten Islands, XXLofoten knows where to find top conference facilities. The 19th century fishing cabins called Svinøya Rorbuer are located in the traditional fishing village of Svolvær, surrounded by the open sea and high mountain peaks. Transport communications and local facilities are within easy reach. Svinøya Rorbuer has complete conference facilities and an excellent fish restaurant called Børsen Spiseri, which opened in 1828. Kalle Rorbuer have top facilities for management meetings, courses and conferences, team building events, concerts, sport tournaments and spa treats. Stay in traditional rorbuer, surrounded by majestic mountains and experience the historic coastal culture that is typical for the area. At Kalle Brygge, you will find everything you need for your event: a restaurant serving fresh, scrummy food based on local ingredients, a meeting room, wi-fi, PA system, bar and pub – even a tennis hall and a sauna. 9 rorbuer with a total of 21 rooms and 60 beds. Anker Brygge's elegant rorbuer are located on the islet of Lamholmen in Svolvær, next to Scandic Svolvær. The pier was built in the 1860s. Today it houses a restaurant, a bar, offices and three luxury suites on the top floor, all of which have retained the the style and atmosphere of the old days. At Nyvågar Rorbuhotell, you stay in historic surroundings that date back to the Middle Ages. The cabins have been restored without losing touch with the traditional fishing culture. The oldest rorbu Alperosen is situated in between the Lofotmuseet, Lofotakvariet and the Espolin. There is a restaurant and a common room, a sauna and outdoor bath tubs. Henningsvær Bryggehotel was built with a good atmosphere, local cuisine and fine wines in mind. The building has a modern design but was constructed with respect to the surrounding landscape in an elegant, rustic style. The interior features logfires, candles and comfortable furniture. For large conferences, banquets and receptions in the Lofoten Islands, XXLofoten recommends Thon Hotel Lofoten and Scandic Svolvær. Thon Hotel Lofoten opened in March 2009 and is connected directly to the Lofoten Culture Hall. The hotel is situated on the waterfront at Svolvær, and is the perfect base for exploring the Lofoten area. Scandic Svolvær, located in the harbour of Lofoten’s main town, is well equipped for both meetings and recreation – why not combine the two? There is a fishing room, which can be used for fishing through a hole in the floor.